Summer in Maine. Is there anything like it? 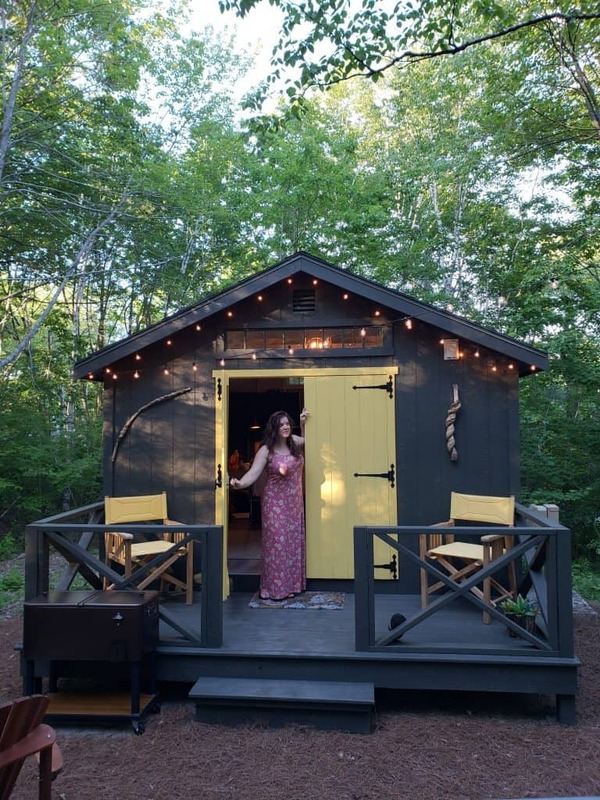 And glamping in Maine makes it even better. 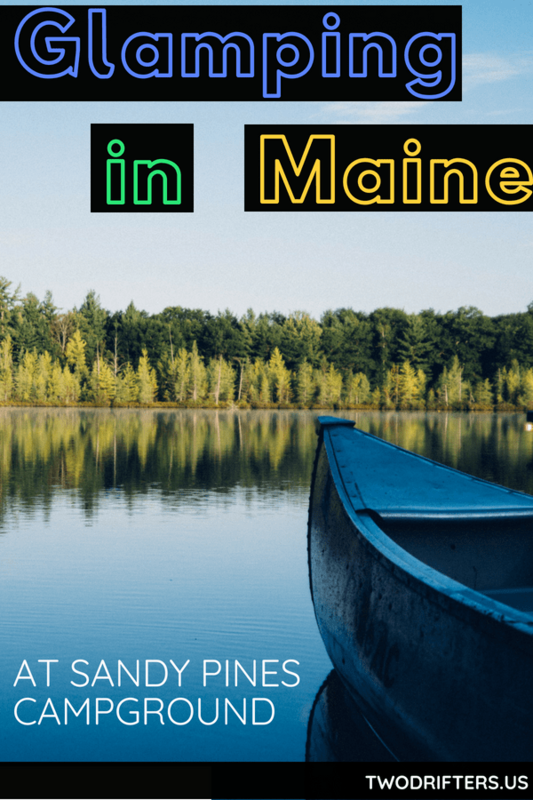 Maine is a huge state with so much to do, both near the coast and further inland. 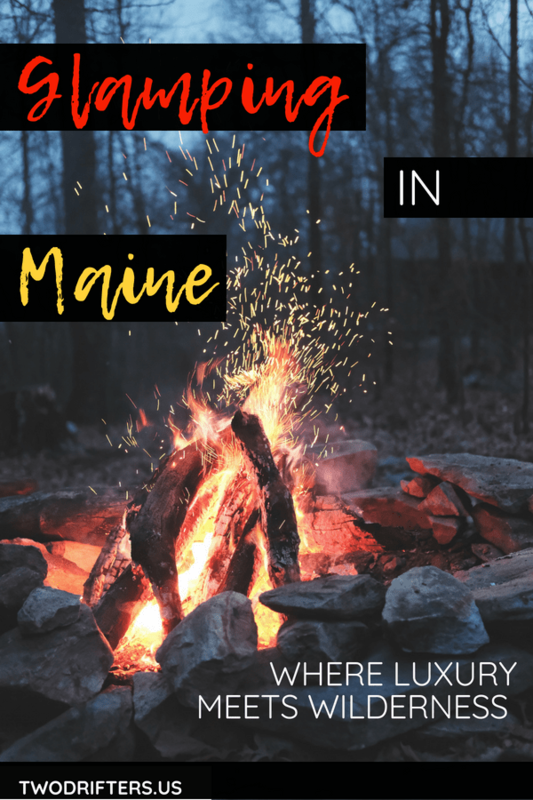 If you’re visiting Maine in the summer or even in early fall, camping is a great way to enjoy your stay. But if camping in a tiny tent in the woods isn’t quiiiiiite your thing, let us introduce you to glamping. 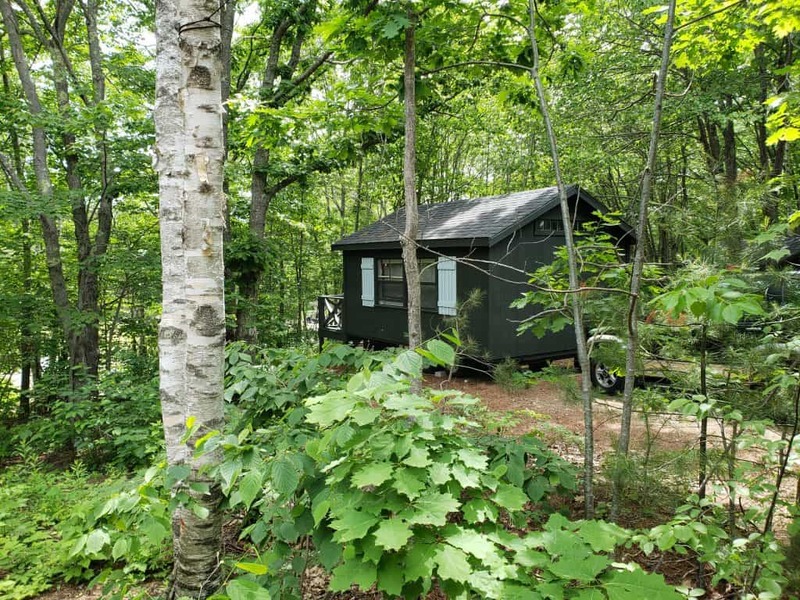 Glamping is a mesh of the words glamour and camping, and it’s basically like having a little piece of luxury in the woods. Glamping has taken the world by storm in recent years, and there are some gorgeous destinations where you can glamp in unbelievable accommodations. Glamping in Maine is much the same. 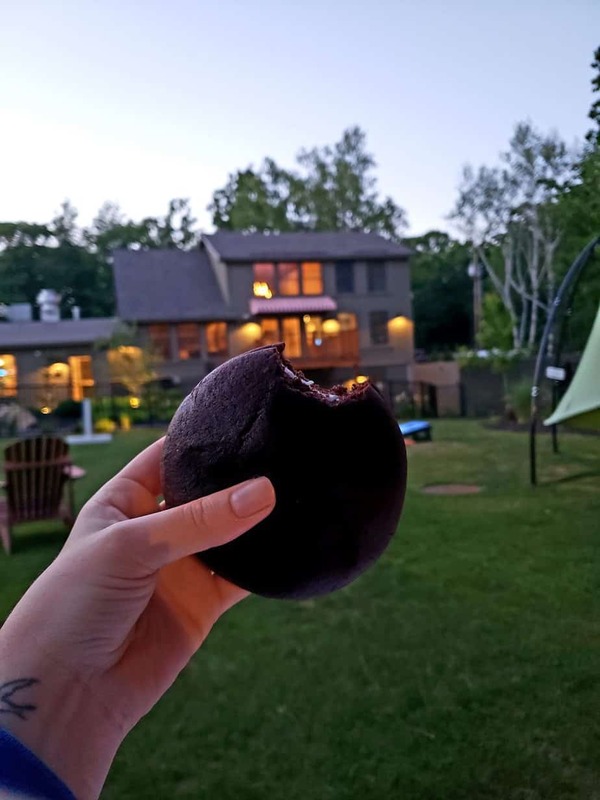 When glamping, you can have all the comforts and amenities of home (for the most part) plus a pretty spectacular fancy tent, hut, or cabin to boot. 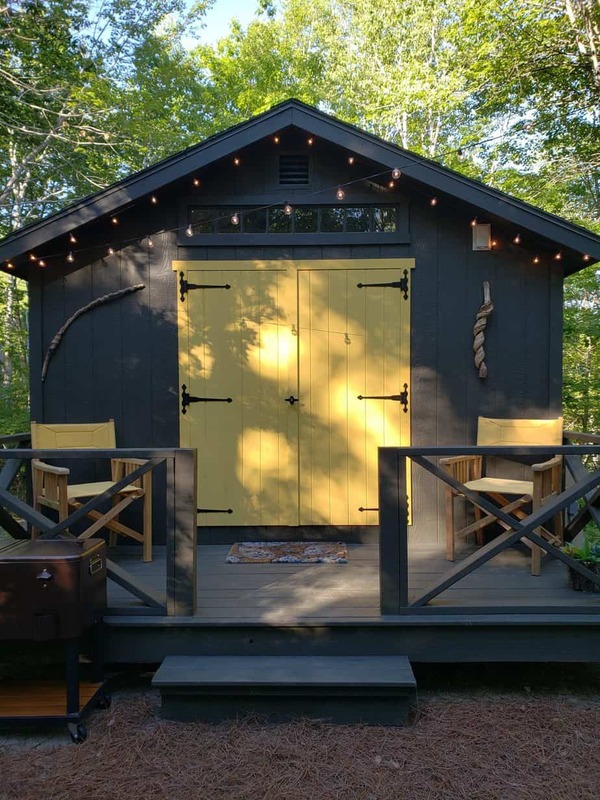 We have a favorite spot for this kind of Maine getaway…. Earlier this summer, we were invited to stay as guests for two nights at Sandy Pines Campground in Kennebunkport, Maine. What a place! We loved it instantly, and so did my mom, who we brought along for the weekend. 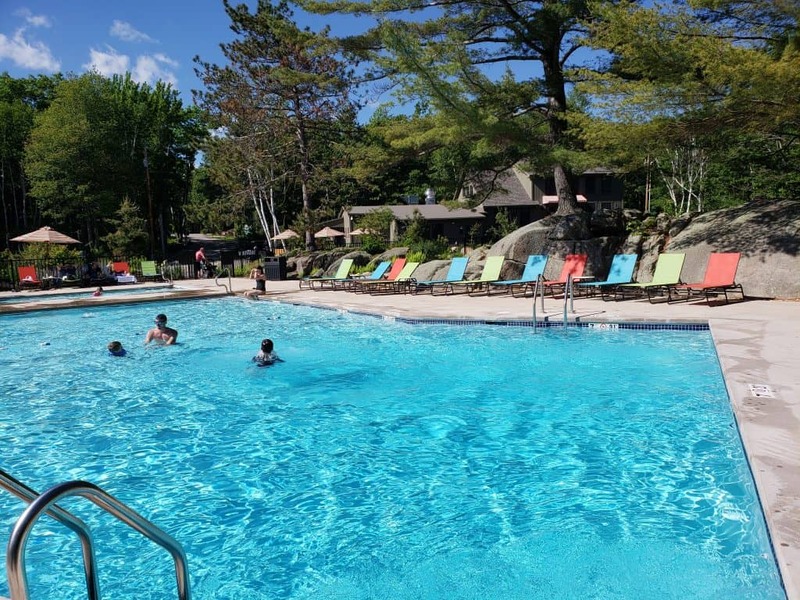 Sandy Pines opened just last year and they’re already welcoming tons of guests. 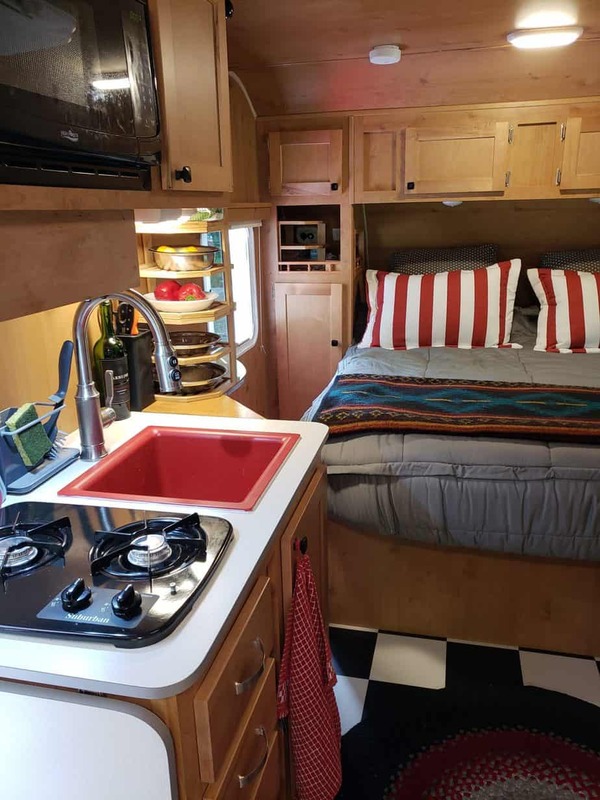 In addition to being a traditional campground, with spots for tent camping, RVs, caravans, etc, they also have several options for glamping. Their glamping tents are really out of this world—each one was uniquely designed. Sandy Pines Campground. Kennebunkport, Maine. One our visit, we stayed in one of the Camp Carriages which were brand new. In fact, I think we were the first people to stay in ours. Along a winding road sits about a dozen of these adorable carriages, which look like cozy cottages from the outside. Inside, it’s like a unique, plush hotel room with it’s own special decor. Each is adorned on the outside with twinkle lights and there’s room out front for parking alongside your fire pit and Adirondack chairs. If you’re craving privacy, each carriage feels secluded, yet not remote, nestled among the tall Maine trees. 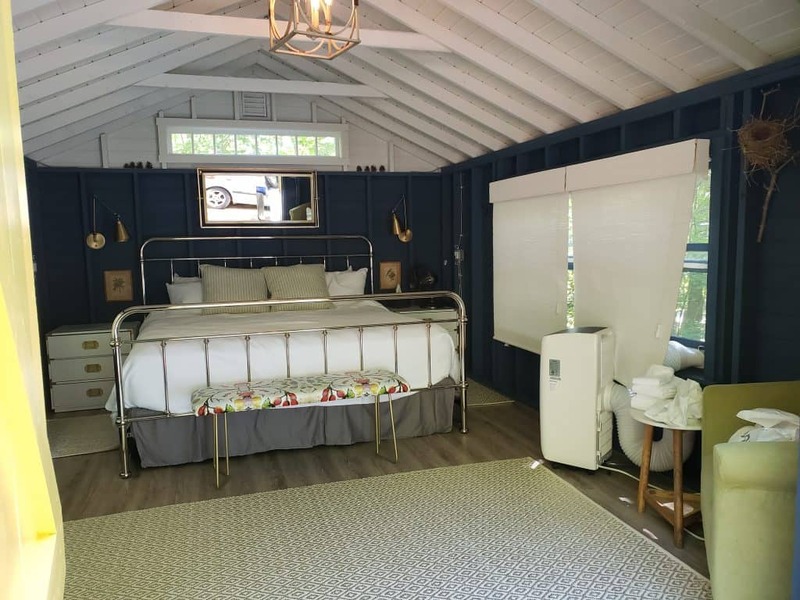 The glamping accommodation is really something special, but the amenities at Sandy Pines are what make it so perfect for travelers. There is a big, beautiful heated salt water pool that you see as soon as you enter. Fringed by brightly colored deck chairs, it is THE most inviting pool. We swam in it as much as we could that weekend. Right alongside the pool is a small grassy area where you can play games like corn hole, or sit in one of the mod-looking suspended tent chairs, where you can while away the afternoon with a book. The Grand Lodge and its attached General Store are the main building on the campground. 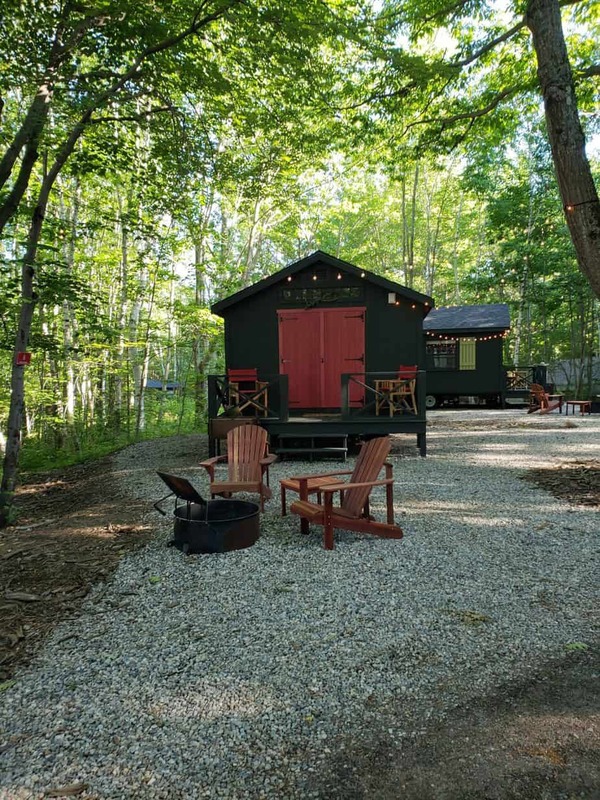 The store is where you’ll find pretty much everything you need for a Maine glamping getaway: firewood, s’mores kits, bug spray, and food and drink, including beer & wine. From there, you can also order a full on boiled lobster dinner. 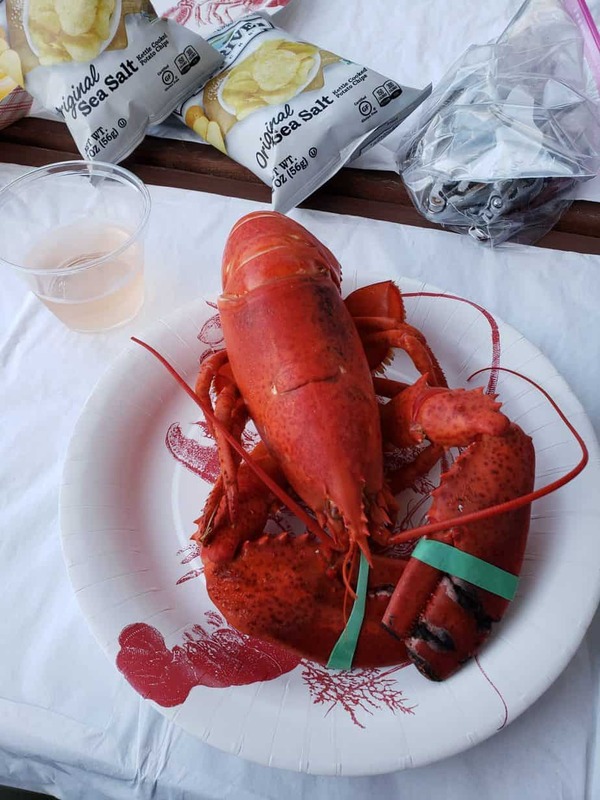 Nothing says Maine like lobster, so throw on your bib and dig in. There is also water nearby, so kayak rentals are on offer. Or drive the car 5 minutes to the nearest beach which is just a mile away. Biking would be even better on a nice summer’s day. 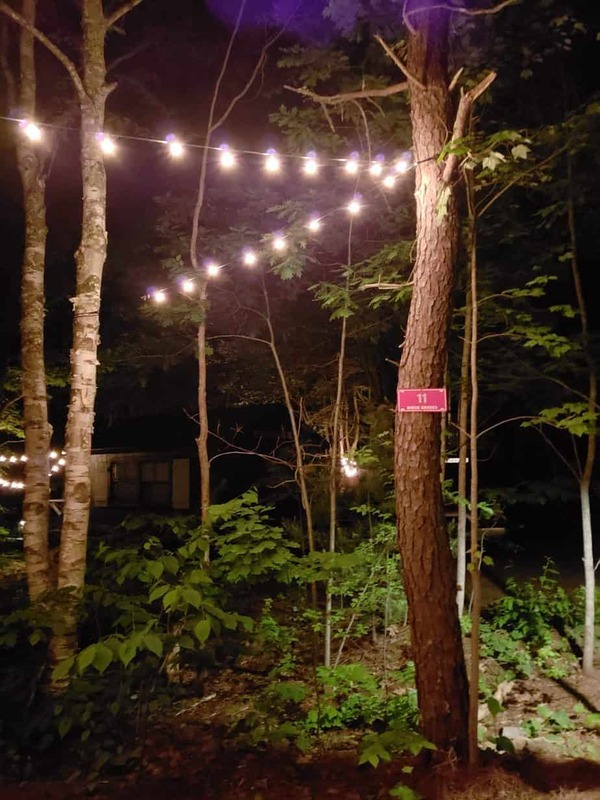 Other activities at the campground include a kids playground, family group activities like movie night, volleyball, badminton, and the Kids Kraft Tent. Sandy Pines holds special events throughout the year. 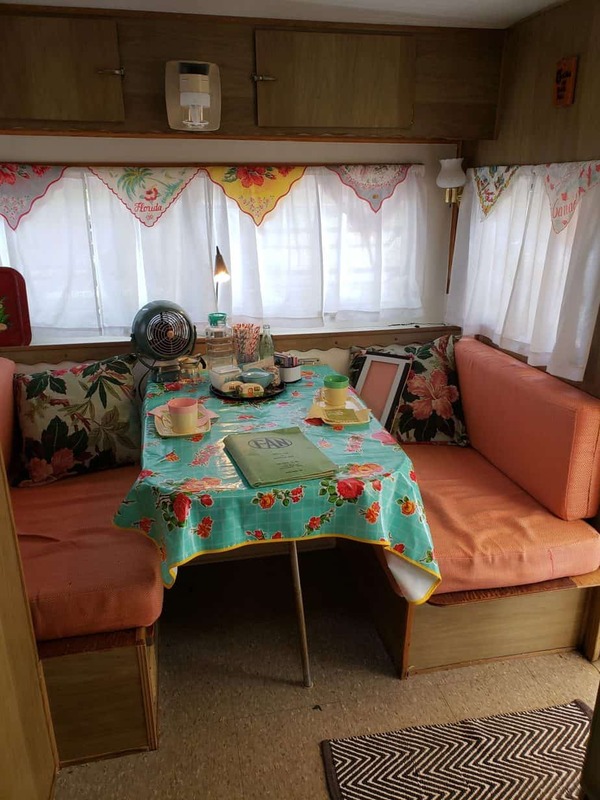 We were lucky enough to be there for their Vintage Camping Weekend. 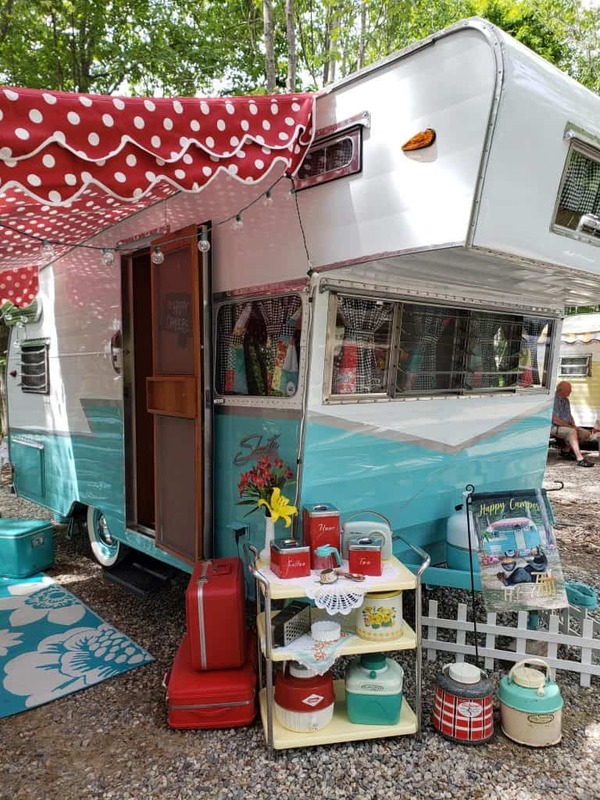 Guests from all across the states converged to share their vintage, old-fashioned teardrop campers, Airstreams, and more. Many of these are absolutely incredible, with a classic style or amazing modern renovations. Take a look at some of what we saw! We’re all about our romantic getaways. Glamping is actually so perfect for this kind of travel. You and your partner get to snuggle up in a cozy yet luxurious spot, with an inviting bed and soft sheets. You won’t find that when tent camping, that’s for sure! 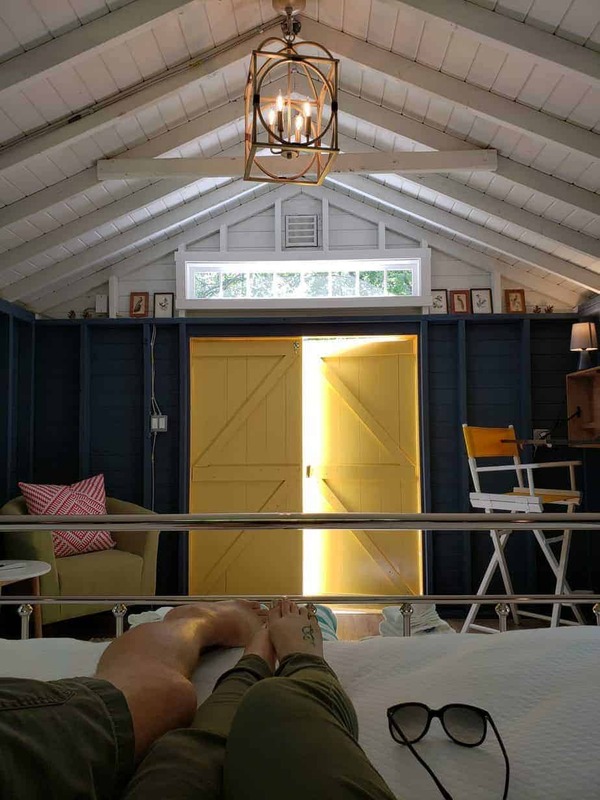 All of the luxurious glamping tents are perfect for two, and the Camp Carriages have a more woodsy vibe with the luxury of a king bed and gorgeous furnishings. At night, step out and light up your fire for a super sweet romantic evening under the stars. Romantic things to do in Maine? 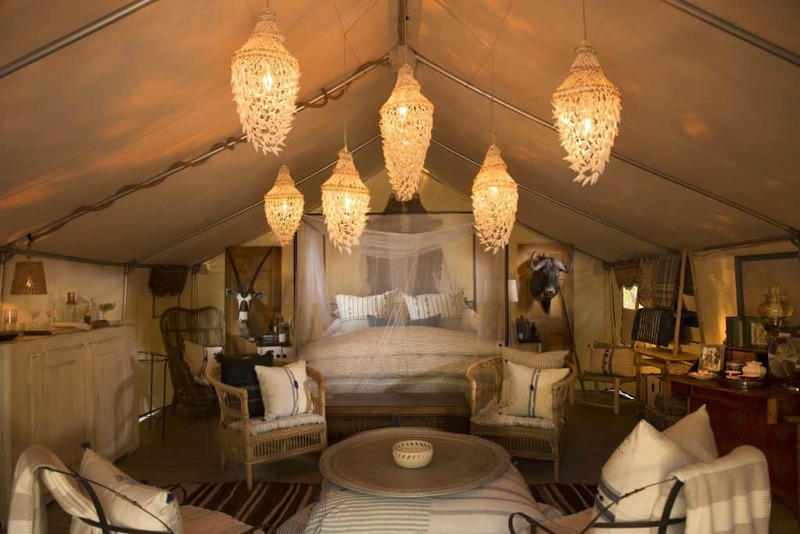 Glamping may top the list! Thinking of glamping as a family? You should totally do it! 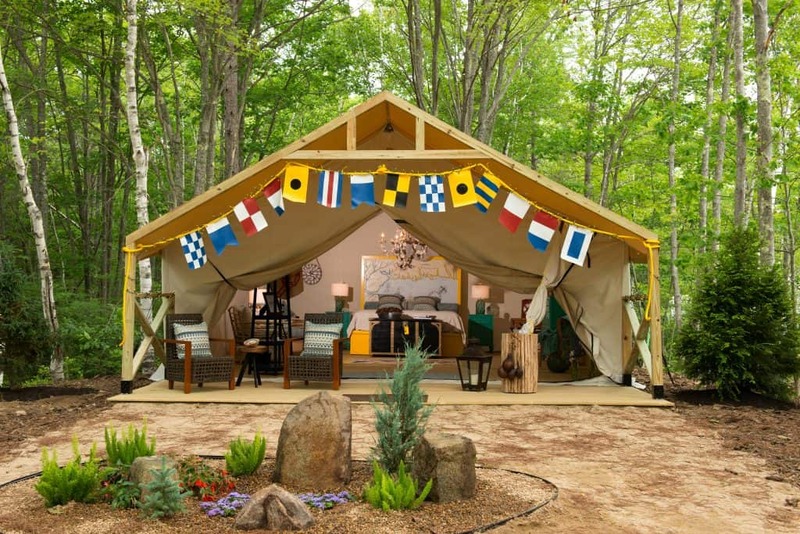 At Sandy Pines, you can get miniature kids glamping tents set up right alongside your adult version. Everyone gets the unique glamping experience, and parents still get some privacy. 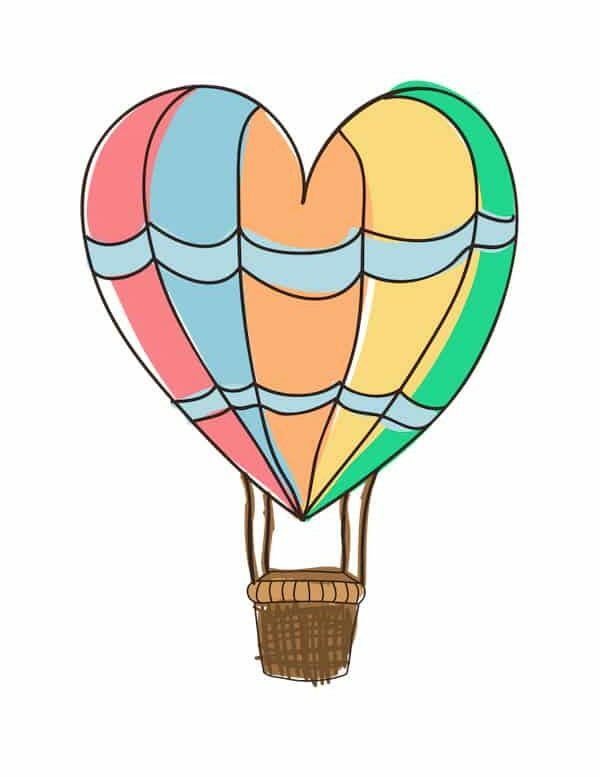 With so many fun family things at the campground, you can feel sure kids will be entertained and love their stay. Camping is also an option here, too. We saw so many families tenting and exploring with kids of all ages. The lots are spacious and attractive, and you can even bring your dog. (Note: you can’t bring dogs into the glamping accommodation, but they are allowed at the regular campsites). One great reason to choose Sandy Pines when deciding where to stay in Kennebunkport is that it is extremely affordable. 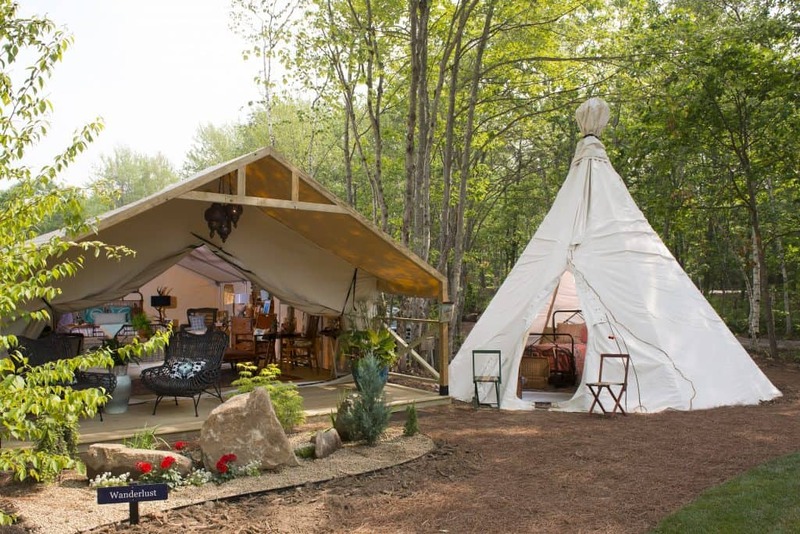 Coastal Maine can get pretty pricey, especially in the high season, but staying in one of the glamping tents or camp carriages is far friendlier on your wallet. And the vibe is far more laid back and fun than you’re likely to find at a seaside B&B. 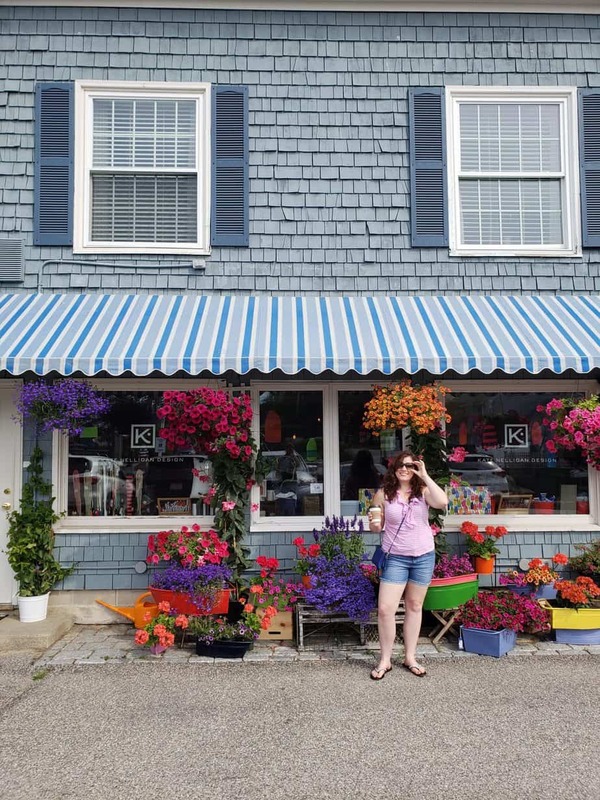 You need never leave the campground to have a fun stay in Kennebunkport, but there’s lots to see and do in the town. 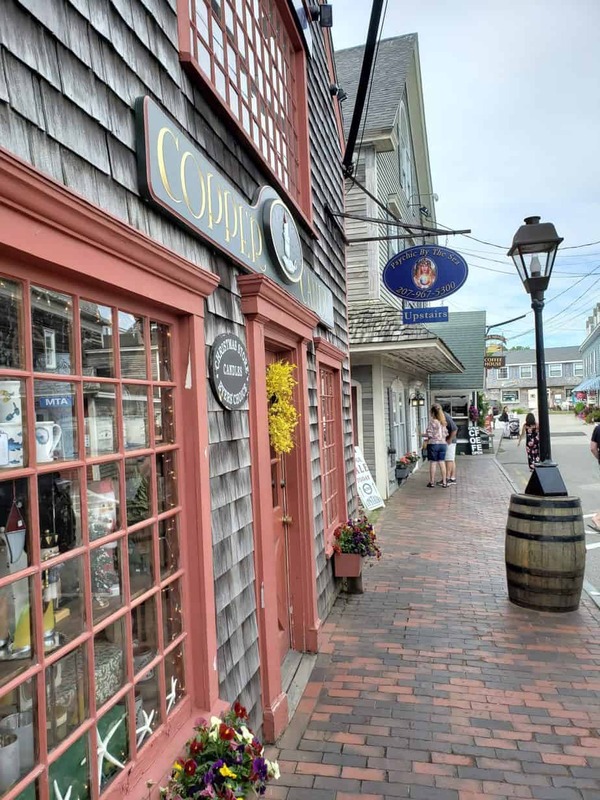 Spend some time exploring the quaint downtown area of Kennebunkport. Maine is famous for its adorable seaside villages, and Kennebunkport is no exception. We enjoyed coffee while wandering in and out of some of these cute shops. 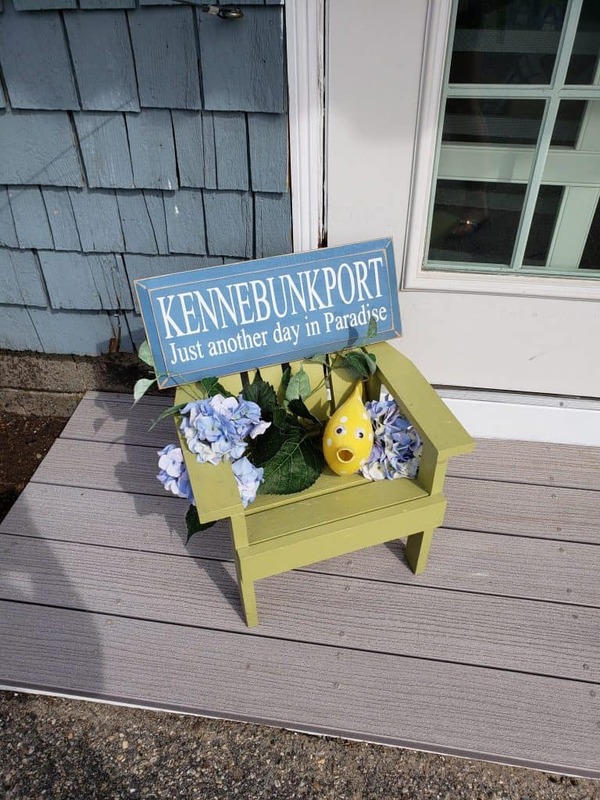 As far as other things to do in Kennebunkport, there are plenty! Visit the nearby Goose Rocks Beach for some leisurely sunbathing. You can also brave the waters for a swim, but this is Maine, so expect chilly ocean temps! There are a few places that are ideal for walks and hikes, including the Rachel Carson National Wildlife Reserve and the nearby Wells National Estuarine Research Reserve. You can fulfil your lighthouse lust with a stop at Wood Island Light, or if churches are more your thing, check out St. Ann’s Episcopal Church which dates back to 1887. This rustic stone church overlooks the ocean. You should also make time to get out on the water. If you want to ride in a real New England lobster vessel, hop on The Rugosa Lobster Tour. For something more laidback, sail along the coastline with Schooner Eleanor Sailing Cruises. Wondering where to eat in Kennebunkport? For a fine dining experience, we highly recommend The Tides Beach Club. Set right across from the beach, the views are breathtaking, although you might not notice with all the delectable food on your plate. Other suggestions on yummy restaurants in Kennebunkport can be found on Sandy Pines website. 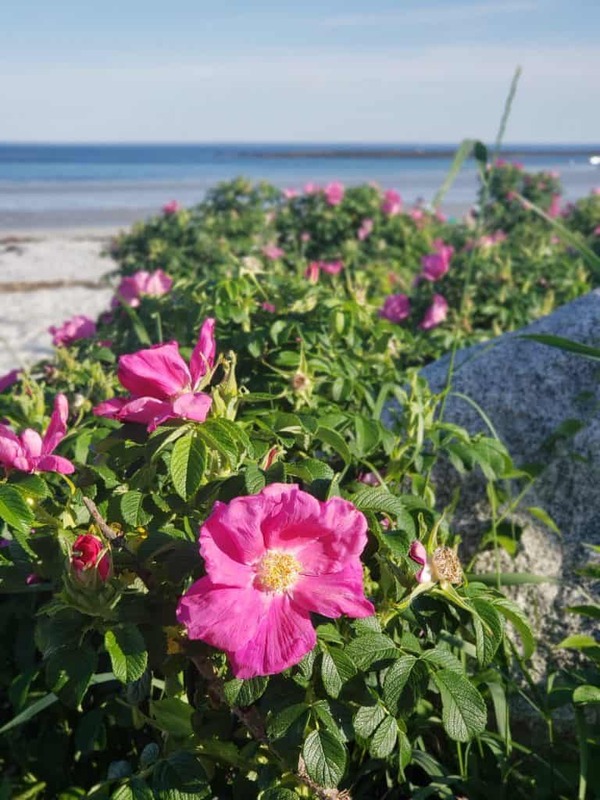 If you’re of the best places to stay in Kennebunkport, Sandy Pines Campground is it!